The man who during his whole life loves the conversation of this yoke-mate fasting is a friend of chastity. Just as the satisfaction of the belly is the source of all evils, and as the slackness of sleep kindles the lust of fornication, so fasting, vigil, and wakefulness in God’s service by withstanding the sweetness of sleep through crucifying the body throughout the day and night, are God’s holy pathway and the foundation of every virtue. Fasting is the champion of every virtue, the beginning of the struggle, the crown of the abstinent, the beauty of virginity and sanctity, the resplendence of chastity, the commencement of the path of Christianity, the mother of prayer, the well-spring of sobriety and prudence, the teacher of stillness, and the precursor of all good works. Just as the enjoyment of light is coupled with healthy eyes, so desire for prayer accompanies fasting that is practiced with discernment. When a man begins to fast, he straightway yearns in his mind to enter into converse with God. For the body that fasts cannot endure to sleep upon its pallet all the night through. Fasting naturally incites wakefulness unto God, not only during the day, but also at night. For the empty body of a faster is not greatly wearied by the battle against sleep. And even if his senses are weakened, his mind is wakeful unto God in prayer. It is better for a man to desist from his liturgy because of weakness due to fasting, than because of sloth due to eating. When the seal of fasting is set upon a man’s lips, his thought reflects with compunction, his heart pours forth prayer, gloom lies upon his countenance, shameful thoughts are far removed from him, cheer cannot be detected in his eyes, and he is an enemy of lusts and vain conversations. No one has ever seen a discerning faster enslaved by evil desires. Fasting with discernment is a spacious mansion for every good thing; but he who neglects fasting makes every good totter. For fasting was the commandment that was given to our nature in the beginning to protect it with respect to the tasting of food, and in this point the progenitor of our substance fell. There, however, where the first defeat was suffered, the ascetic strugglers make their beginning in the fear of God as they start to keep His laws. And the Saviour also, when He manifested Himself to the world in the Jordan, began at this point. 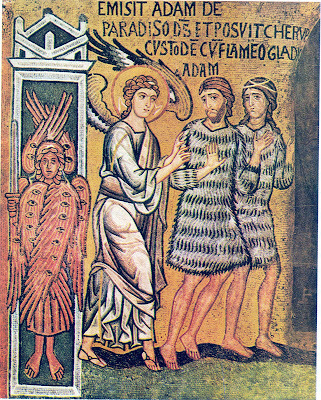 For after His baptism the Spirit led Him into the wilderness and He fasted for forty days and forty nights. Likewise all who set out to follow in His footsteps make the beginning of their struggle upon this foundation. For this is a weapon forged by God, and who shall escape blame if he neglects it? And if the Lawgiver Himself fasts, who among those who keep the law has no need of fasting? This is why the human race knew no victory before fasting, and the devil had never experienced defeat from our nature; but this weapon has made him powerless from the outset. Our Lord was the firstborn Leader of victory, so as to set the first crown of victory upon the head of our nature. When the devil, that foe and tyrant, sees a man bearing this weapon, he is straightway frightened and he recollects and considers that defeat which he suffered in the wilderness at the hands of the Saviour; at once his strength is shattered and the very sight of this weapon, given us by our Commander-in-chief, burns him. What weapon is more powerful and gives more boldness to the heart in the time of battle against the spirits of wickedness, than hunger endured for Christ’s sake? For the more the body toils and endures hardship when the phalanx of the demons encompasses a man, the more his heart is given succour by the power of confidence. He who has armed himself with the weapon of fasting is afire with zeal at all times. Elias the zealot also pursued the work of fasting when he was zealous for God’s law. Furthermore, fasting reminds the faster of the commandments of the Spirit and it is an intermediary between the old Law and the grace given us by Christ. He who is negligent with respect to fasting is slothful, heedless, and feeble in the other ascetical struggles as well and he manifests an inception and an evil token of slackness in his soul, thus giving his antagonist an opportunity for defeating him. It is evident that he who enters naked and unarmed into the struggle will retreat from it without gaining the victory; for his limbs were not shielded with the warmth of fasting’s hunger. Such is the nature of fasting, that whoever perseveres in it will possess an unshakeable mind, one ready to encounter and repel all the troublesome passions. 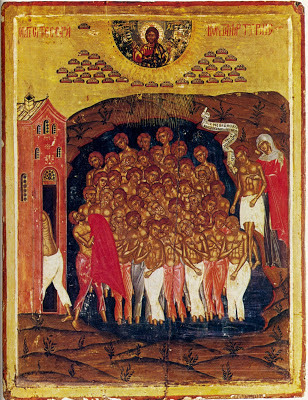 It is said concerning many of the martyrs, that when they foreknew, either by revelation or by information received from one of their friends, the day on which they were to receive the crown of martyrdom, they did not taste anything the preceding night, but from evening till morning they stood keeping vigil in prayer, glorifying God in psalms, hymns, and spiritual odes, and they looked forward to that hour with joy and exultation, waiting to meet the sword in their fast as ones prepared for the nuptials. Therefore let us also be vigilant, we who are called to an unseen martyrdom so as to receive the crowns of sanctification, so that we may never give our enemies a sign of denial with any member or part of our body. St Isaac the Syrian, First Collection, from Homily 37. Source. It was Sunday morning. 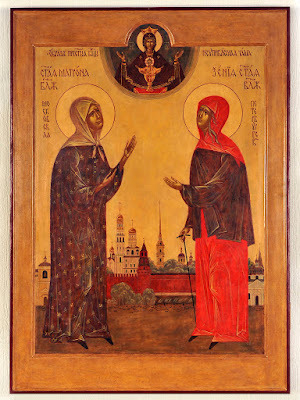 I was sitting very worried on the veranda of my house, and was praying to St. Matrona the Blind of Russia, whom I had visited several weeks before at the Church of the Annunciation of the Theotokos, Perissos, where a portion of her Holy Relics and her wonderworking icon is. I had heard of numerous miracles which the Saint worked, and with contrition and tears in my eyes I asked her to grant healing to a problem of my daughter, Angeliki. She was suffering from strabismus of her right eye, and we were trying in every way to have the child avoid an operation. I had taken some Holy Oil from the vigil lamp of the Saint, and I anointed her little eye, and prayed day and night with tears in my eyes that she be healed. The Saint, who greatly loves people in pain, and especially young children, did not hesitate to grant healing to my child, and she did not need medical intervention. I thank the Saint for her great miracle. May her holy name be blessed unto the ages. I am a sinner, who was made worthy to see a great miracle of God and St. Matrona the Russian. I knew that every Monday evening, the Church of the Annunciation of the Theotokos in Perissos serves Paraklesis to the Saint, and I also came to entreat her help for a great problem of mine. A short time before I had an accident. Nothing could be done to improve my situation. The unbearable pains on the one hand, and my terrible psychological state on the other, had made my life a martyrdom. But God, however, Who heals every sickness and every infirmity of men, through the intercessions of St. Matrona, worked a miracle for me that evening. The Paraklesis service had not even finished, when I began to sense the weight of pain and my bad psychological state disappear, and I felt as when I healthy. Great is my joy, but also my thanks towards the Saint, because from that instant, I the pain and my terrible psychological state ceased, like a threat was cut. My honored Elder Athenagora, bless. Before long I wanted to inform you regarding the goodness and healing which I received from St. Matrona the Russian, the protector of Christians and the refuge of those who suffer and are sick. Burdened by a malignant tumor and terrible pains in my abdominal area, I walked my road thinking that the end was approaching. Within me, however, something told me that nothing is finished. 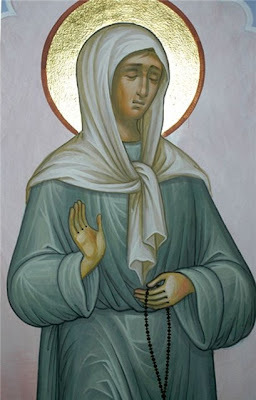 With this thought, and also with the faith which I have had since childhood (a gift of my mother) I began to seek the help of God and the intercessions of the wonderworking St. Matrona. 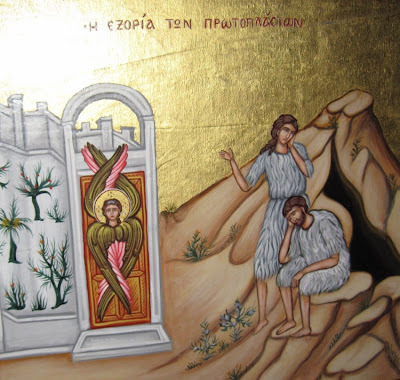 Many times I proceeded to the imposing icon stand of the Saint, crying, entreating; I took holy oil from her vigil lamp and daily crossed and anointed the place on my body where the tumor was. After a time, my doctor ordered a CAT scan, and—O the paradoxical wonder!--the tumor had regressed. The pains had abandoned me, and I returned to my home full of joy and more healthy. Ten months have passed since then, and with the grace of God and the intercessions of St. Matrona, I am blessed with perfect health! 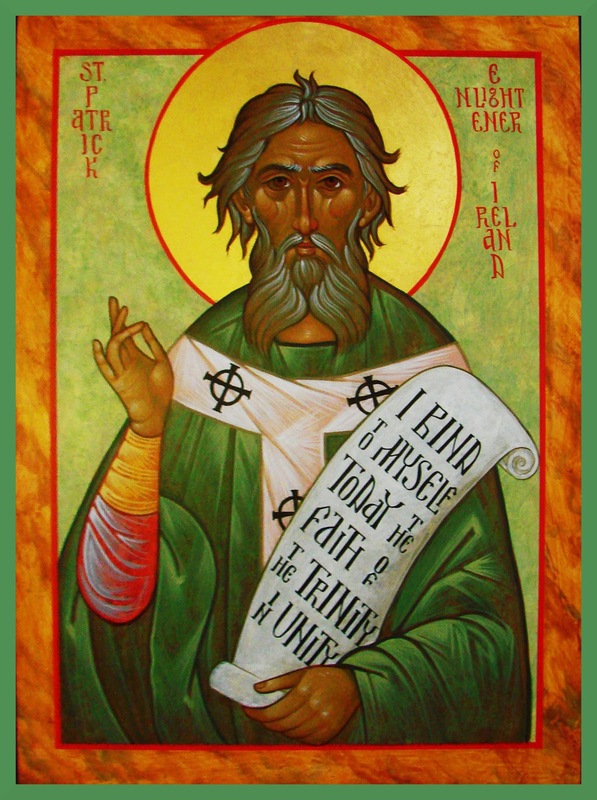 Thank you, my Saint, for your general blessing to me, the sinner, which I believed that I received unworthily. We visited the Holy Church of the Annunciation of the Theotokos, when my husband and I were invited to a wedding of one of our friends. Before the mystery began, we were walking through this beautiful church of our Panagia, and at one place, I discerned an large veneration stand with a large icon covered with gold, and I went to venerate. I responded that I didn't know. He, with great goodness, informed me of the life of the Venerable Matrona. He spoke of her miracles. I had great pain within me, because after a long period of marriage, I had not yet given birth to a child. I cried and I told him that I prayed for myself and for my husband that the Saint entreat us to the Lord to grant us a child. 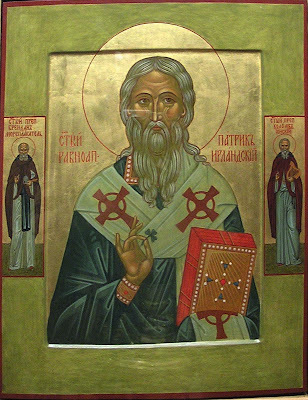 The blessed priest nobly told me: “You and your husband pray daily, and I will light a candle to the Saint every day for you.” After three months, after much prayer, I became pregnant and gave birth to a baby boy, whom we baptized in that church, glorifying God and St. Matrona for their great gift to our unworthiness. I also thank you, O Elder Athenagoras, for your prayers and your love. Crying and anointing himself with the holy oil from the vigil lamp of the Saint, he went to the church office, troubled. After a short time, having anointed the area of the infection with the sign of cross, the abscess opened and began to pour forth pus, thus healing the problem that afflicted this aforementioned priest. I furthermore wish to mention that the year before, he faced the same problem with his left ear, but unfortunately, he had to have a procedure for his healing in the past. My Saint Matrona, I thank you for your help and the healing that you offered to my child Nicholas, who had a great problem with dyslexia. Special researchers had informed me that he had a serious problem. They tried therapy to help him, without giving us confirmation that it would be successful. However, as I knew of your miracles, I took my child and, holding flowers in my hands which you love so, I entered the church which treasured your relic and your icon, and with tears in my eyes, I entreated for my child. I believed that you herd me, that you hearkened to the cry of a pained mother. I took holy oil from your vigil lamp and every day for forty days, I anointed the mouth of my child. The miracle did not delay. My child after some time, and through the help of specialists became well. Receive again our thanksgiving and gratitude. Once, my son Gregory had a serious problem with his health, which manifested itself as a problem with his heart. Later after fervent and earnest supplication, St. Matrona worked her wonder and the problem turned for the better, and he had a positive outcome and effective treatment. 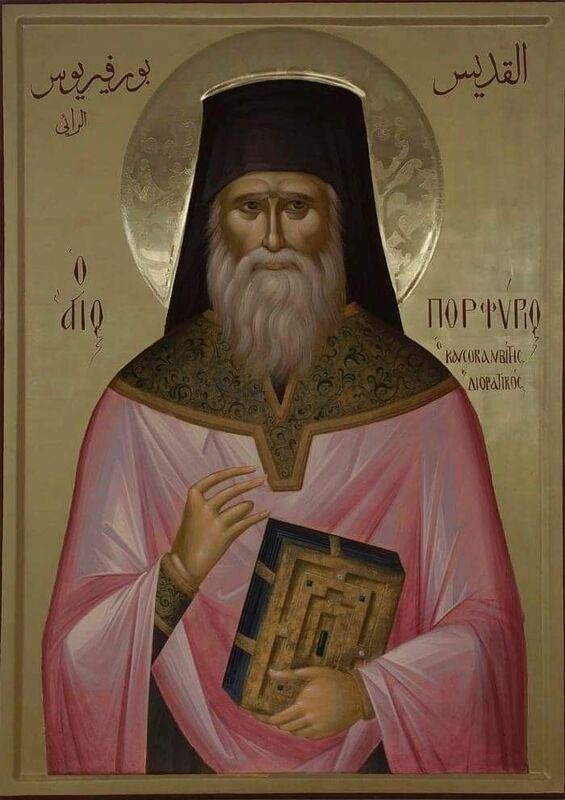 A second time, for a serious problem of my wife Ioannas' health, she had a positive resolution through the help of St. Matrona, to whom I had taken refuge again, with faith and fervent supplication for help. A third time, my father in law Christo had a very serious problem, and through the presence of St. Matrona, he had the best intervention that he could have in everyone's view, with unbelievable and results so far. They did not have any doubt of the immediate help of our Saint, and when I asked of her, as when anyone with faith asks for the intercessions towards the Lord from some Saint, then he is sure that he will have it. Source: Archimandrite Athenagoras Kolyva, The Venerable St. Matrona the Russian the Blind and Wonderworking Citizen of Heaven, Athens 2011. ...But having truly all of this, the Physician has come to the sick, and the Sun of Righteousness has dawned for those who sat in darkness, the Anchor and Calm Harbor to those storm-tossed, the Intercessor has been born for the despised slaves, and peace has been united, and the Redeemer of captives has come, the strong unspeakable Joy and Love and Protection has come for those who are embattled. 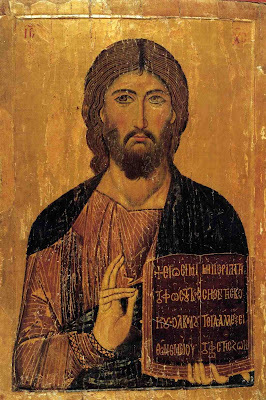 He is our peace, as the divine Apostle says, through Whom we have all received grace, Christ our God, to Whom belong glory to the ages of ages. Amen. In the Law, God laid down that the sons of Israel should each year give tithes of all they possessed, and if they did so they were blessed in all their works. 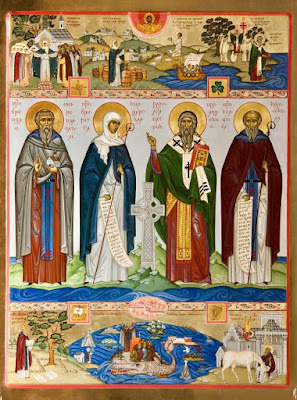 The holy Apostles, knowing this to be for the help and advancement of our souls, resolved to fulfil it in a better and higher way, namely, for us to deliver up a tithe of the very days of our lives as if to consecrate them to God, so that we may be blessed in all our works, and each year to be unburdened of the whole year’s sins. They elected to consecrate out of the three hundred and sixty-five days of the year, seven weeks of fasting, and so they ordained; but our Fathers, in their time, thought it advisable to add another week, both to train and better prepare themselves to enter on the labor of fasting and to honor with their fasting the holy number of forty days which our Lord fasted. 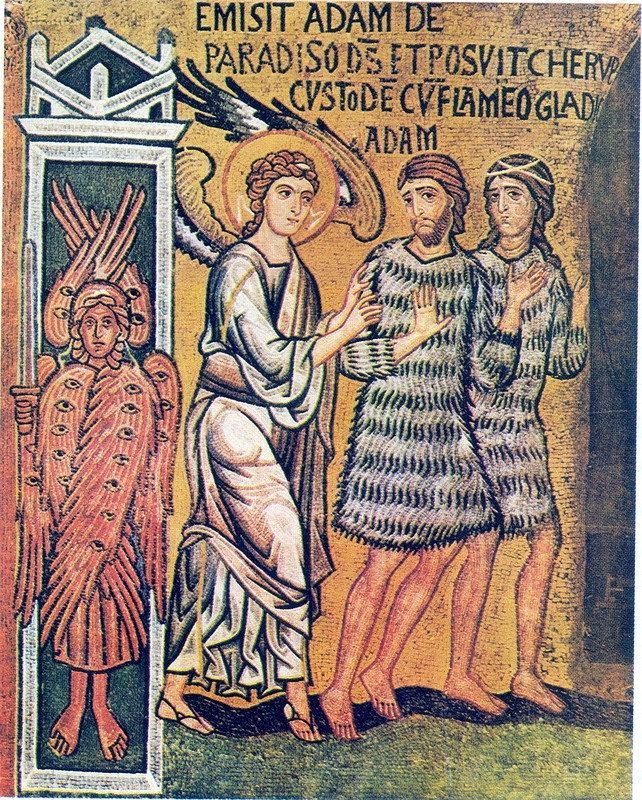 The eight weeks, subtracting Saturdays and Sundays, makes forty days, but we honor Holy Saturday with a fast because it is a very holy day and the only Saturday fast of the year. The seven weeks, without Saturdays, gives thirty-five days, and if we finally add the half of the brilliant and light-giving night, this makes thirty-six and a half, which is exactly a tenth of three hundred and sixty-five. For thirty is the tenth of three hundred, six is the tenth of sixty, and the tenth of five is one half. Here then, are the thirty-six and a half days, the very tithing of the whole year as one might say, which the holy Apostles consecrated to penance for the cleansing of our sins of the whole year. Whoever, therefore, keeps careful guard over himself, as is fitting during these holy days, will be rewarded with blessings, brothers, even if it happens that, being a man, he has sinned either through weakness or carelessness. 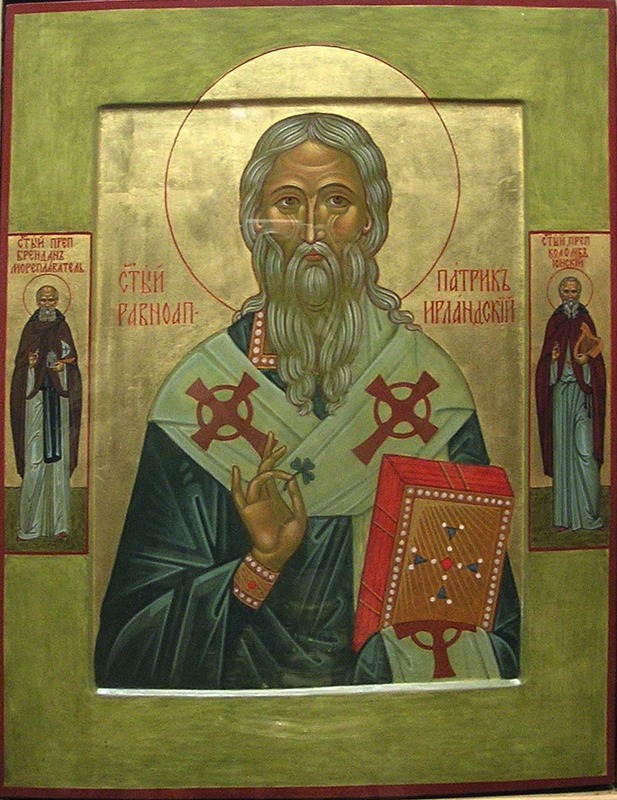 You see, God gave us these holy days so that by diligence in abstinence, in the spirit of humility and repentance, a man may be cleansed of the sins of the whole year and the soul relieved of its burden. Purified, he goes forward to the holy day of the Resurrection, and being made a new man through the change of heart induced by the fast, he can take his part in the Holy Mysteries and remain in spiritual joy and happiness, feasting with God the whole fifty days. 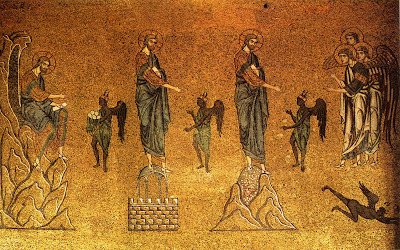 Paschal time, as has been said, is the resurrection of the soul and the sign of this is that we do not kneel in church during the whole season up to Pentecost. Everyone who wants to purify himself of the sins of the whole year during these days must first of all restrain himself from the pleasure of eating. For the pleasure of eating, as the Fathers say, caused all men’s evil. Likewise he must take care not to break the fast without great necessity or to look for pleasurable things to eat, or weigh himself down by eating and drinking until he is full. There are two kinds of gluttony. There is the kind which concerns taste: a man does not want to eat a lot but he wants it to be appetizing. It follows that such a person eats the food that pleases him and is defeated by the pleasure of it. He keeps the food in his mouth, rolling it round and round, and has not the heart to swallow it because he enjoys the taste. This is called fastidiousness. Another man is concerned about satisfying himself. He doesn’t ask for fancy food nor does he care especially about whether the taste is nice or not, he only wants to eat and fill his stomach. This is gluttony. I will tell you how it gets its name: margainein means to rage furiously, to be mad; according to the profane, margos is the name given to the man who rages furiously or is mad. When this disease or mania for packing his belly full of food comes upon a man, therefore, it is called gastromargia, the madness of the stomach, whereas laimargia is the madness of the palate. These must be guarded against and abandoned seriously by the man who desires to be cleansed of his sins. They accord not with the needs of the body, but with its vicious inclinations, and if they are tolerated, they lead a man into sin. As is the case with legitimate marital union and fornication, the practice is the same but the object is different. In the one case, there is copulation in order to raise a family, in the other, to satisfy a desire for pleasure. The same is true with feeding: in one case it is a question of the body’s needs and in the other of eating for pleasure. The intention is what makes it a sin. A man eats to satisfy a need when he lays down how much he will take each day and, if what he has determined on overloads him, takes a little less, or if he is not overloaded and his body is weakened, adds a little. And so he estimates exactly his need and he bases his conclusion not on pleasure but on preserving the strength of his body. And what he takes he receives with prayer, deeming himself unworthy of that comfort and he is not on the look out to see if others, as is likely, because of special need or necessity are given special attention, lest he himself hankers for that comfort or think it a trivial thing for the soul to be at rest. One day when I was in the monastery, I went to see one of the elders–and there were many great men among the elders there. I discovered that his disciple sat down to eat with him, and in private I said to the young man: You know, brother, these elders whom you see eating and taking a little recreation are like men who had deep purses and kept at work, always putting something into them until they filled them up. And after sealing them up they went on working some more and amassed another thousand crowns, so as to have something to draw on in time of need, and so they preserved what was sealed up in the purse. And so it is with these elders. They persevered in their labors, always storing up treasures for themselves, and after sealing up the treasure they worked a little more, and they hold these treasures in reserve for times of sickness and old age so they have something to draw on, and still preserve the treasures they have stored up. But we haven’t even a purse to draw on! As I was saying, therefore, we ought, even if we take food out of necessity, to consider ourselves unworthy of any kind of special relief or even of monastic life itself–and not take food purely for pleasure, and in this way food will not bring our condemnation. Enough about sobriety in eating. We must not only keep a sharp watch over our diet, but keep away from all other kinds of sin so that as our stomach keeps fast, so also may our tongue as we abstain from calumny, from deceit, from idle talk, from railing and anger and all other vices which arise from the tongue. So also let our eyes keep fast. No looking for trivialities, no letting the eyes wander freely, no impudent lying in wait for people to talk to. The same with the hands and feet, to prevent them from doing anything evil. Fasting in this way, as Saint Basil says, is an acceptable fast and, leaving behind all the evil to which our senses are inclined, we may come to the holy day of the Resurrection, renewed and clean and worthy to share in the Holy Mysteries, as we have already said. First we go out to meet our Lord and receive him with palms and olive branches and seat him on the colt and come with him into the Holy City. What does this mean, sitting on a colt? He is seated on a colt that he may convert the soul (which, as the Prophet says, has become irrational and is compared to senseless beasts) into an image of God, and subject it to his own divinity. What does it mean, going to meet him with palms and olive branches? When someone marches out to war against an adversary and returns victorious, all his own people go before him with palm branches to mark his victory. The palm-branch is the symbol of victory. Again, when one man is injured by another, he desires to approach an authority who can vindicate him. He carries an olive branch and calls out, asking to be heard and helped. The olive branch is the symbol of mercy. Therefore, we go out to meet our Master Christ with palms because he is victorious–for he conquered our enemy–and with olive branches–for we are asking his mercy. May we, by asking, conquer through him and be found carrying the emblems of his victory, not only the victory by which he won for us, but also the victory which we won also through him by the prayers of all the Saints. Amen. I entreat you, O brethren, let us repent of the rest, let us awaken, let us be vigilant, let us cast off the deep sleep of sin. Come, hearken, and I will tell you, all those who fear God. Come, hearken to spiritual and saving deeds and words. Come, learn of saving and God-pleasing desire. Come, learn how God our Savior is confessed. Come, before the festival of this life is dissolves. Come, before the gates of life are closed, before death comes and finds us unprepared. Come, before the sun sets, before the light turns to darkness. Come, hearken all nations, and listen, all who dwell throughout the world. Come, all those born on earth and sons of men, rich and poor. Come, noble and glorious, slaves and free. Come, every race and age, men and women, small and great, young and old. Come, O priests of the Lord, and all the fullness of the Church from one end of the world to the other. Come, youths and virgins, priests with young people. Come kings of the earth, whether wise or selfish. Come, let us fall down before the Lord Who made us, for He is our God, and we are His people, and the sheep within his hand. Come, behold how we have entered this world naked, and again we shall depart for there naked. Come, let us confess the Lord in tears and groaning, in almsgiving and goodness to the poor, for He teaches us how we can be saved. Let us therefore weep, O brethren, that we might not be tortured there eternally. Let us have mercy, that we be shown mercy, that we be forgiven. 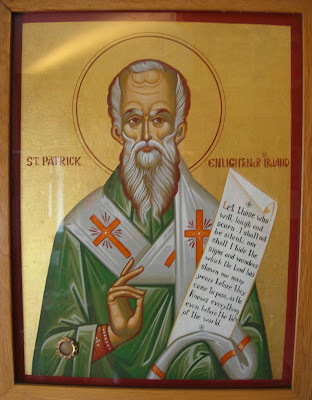 Thus says the Hierarch Patrick to the Orthodox Christians who dwell on the isle of Ireland, on this island where he preached Christ: Do not fear, little flock, for you go forth through the snares of evil beliefs and you dwell among wolves who divide the flock. 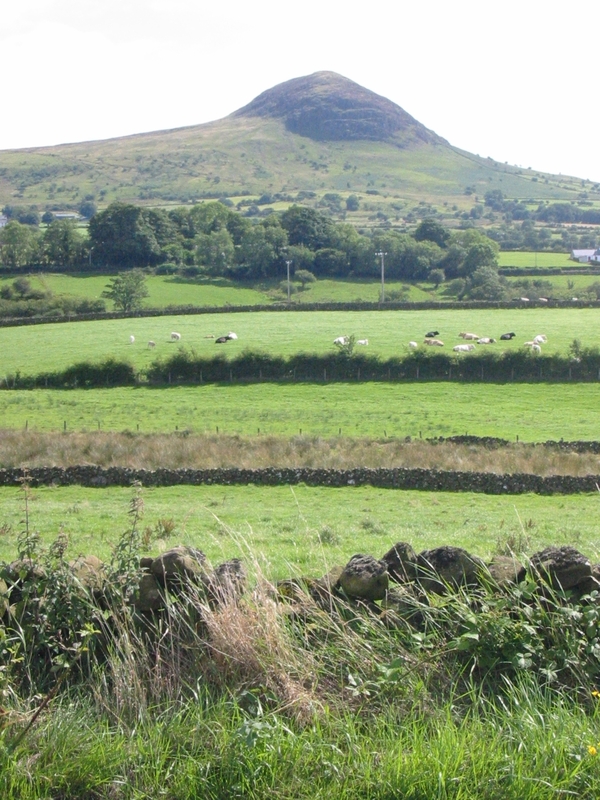 For behold, I am with you, who in you sowed the seed of piety and delivered the people from the delusion of the druids. 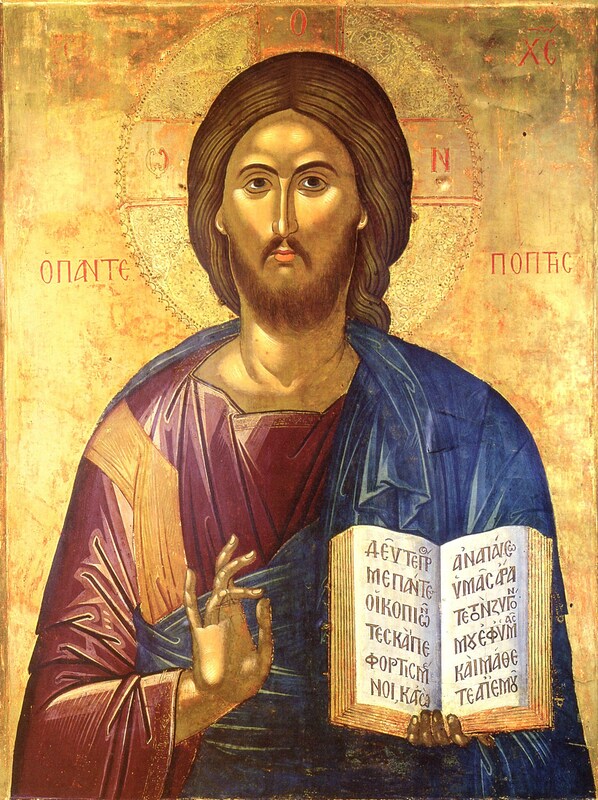 Only live rightly according to the Gospel, and gather in the faith as one soul, and do not be frightened by anything that you may suffer, and I will ceaselessly pray on behalf of you, entreating for us for the remission of sins and the great mercy. 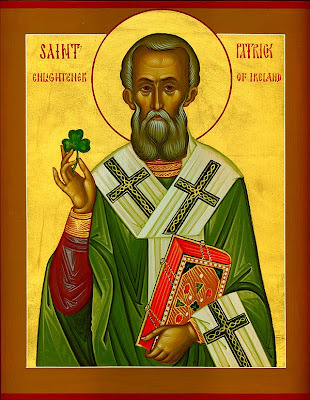 Note: Taken from the full Orthodox service to St. Patrick (in Greek), which is available here. When you love Jesus, despite your many weaknesses and your awareness of them, you rest assured that you have overcome death because you are in communion with Jesus’ love. We ought to feel that Jesus is our friend. He is our friend. He confirms it Himself when He says: ‘You are my friends…” (John 15, 14).We ought to look up to Him and approach Him as our friend. If we fall, if we commit an offence, we ought to approach Him with love and courage and be filled with trust bestowed to us by our mutual friendship without fearing His punishment. We ought to tell Him: ‘Yes, Lord I have done this, I have fallen, forgive me”. At the same time we ought to feel that He loves us, that He receives us with tenderness and love and that He forgives us. Let our trespasses not separate us from Jesus. If we believe that He loves us and that we love Him, we will not feel strangers, neither we will feel separated from Him, not even when we commit a sin. We have secured His love and no matter what we do, we know that He loves us. The Gospel, speaking allegorically, warns that the unjust will be taken to the place where there will be “weeping and gnashing of teeth” (Matthew 25, 30); indeed this is how it is going to be for someone who lives away from the Lord. Several of the Niptic fathers also speak about the fear of death and of Hell. They say: ‘You must always remember death’. Such words, if examined deeply, cause the fear for Hell. Someone who is trying to avoid committing a sin nurtures such thoughts, so that his soul is overcome by the fear of death, of Hell and of the devil. Everything has its own importance at the appropriate time and the right circumstances. The fear of death is appropriate at the early stages of spiritual struggle. It is right for the novices, for those whose old-self is still active. The novice, who has not yet had the chance to be ‘sensitized’, is kept from sinning by this fear. Fear is necessary since we have a physical nature prone to wickedness. However, this is an elementary stage, an early level of relating to the divine. At this level the relationship with the Lord becomes a transaction: to gain Paradise and to avoid Hell. If we examine this properly we will see that it reeks from some kind of selfishness and self-interest. I do not like this route. As soon as one progresses and enters the love of the Lord, why does he need fear? Whatever he does, he does it out of love and this is more important. It is not worth that much if someone becomes good because he fears the Lord and not because he loves Him. Whoever would like to become a Christian ought to become a poet first. Once the soul is knocked about it becomes undeserving of Jesus’ love; Jesus interrupts the relationship since He does not want ‘thick’ souls with Him. When you are worshiping the divine make sure that no one sees you nor recognizes what you are doing. You ought to do all these in secret, like the ascetics. Remember when I mentioned the nightingale? It sings in the forest, when there is silence, so that no one hears it neither praises it. What a magnificent singing in the desert! Did you notice how its throat swells? The same thing happens to the person who loves the Lord. As soon as he experiences this love, his ‘throat and his tongue swell”. He runs in the wild, in the desert and communicates with the Lord in secret, “with inexpressible sighs”. You ought to ignore your passions; do not preoccupy yourselves with the devil. Turn towards Jesus instead. Divine grace teaches us our duties. We must employ love and longing in order to draw divine grace. 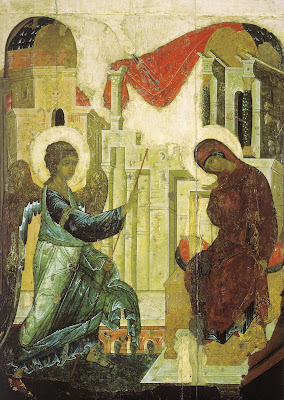 The grace of the Lord needs divine Eros. Once we have acquired love, then we are ready to pray. The Lord comes to such a soul by Himself as soon as He finds some pleasing things: a good intention, humility and love. Without these we are not able to say: ‘Lord, Jesus Christ, have mercy on me”. The slightest criticism against someone else, affects our souls and we become unable to pray. The Holy Spirit does not dare approach such a soul. We ought to let the Lord do what He wants with us; this is more beneficial and more appropriate for ourselves and for those whom we are praying for. Jesus will hand over all things in abundance. However, with the slightest selfishness, nothing can happen. The Lord has His own reasons for not giving us whatever we ask of Him. He has His own ‘secrets’. Unless you obey your spiritual father and show humility, Jesus’ prayer (Lord, Jesus Christ, have mercy on me) will not work and you risk being deluded as well. Do not recite this prayer as a chore. If you apply pressure you may be harmed. Several people have fallen ill because they were reciting Jesus’ prayer under pressure. It can be done, of course, but it is not a healthy way to pray. You do not have to concentrate excessively in order to recite Jesus’ prayer. You do not need special effort when you have divine Eros. Any place is appropriate for this prayer: sitting on a low chair, on an armchair, in the car, while on the road, at school, at the office, anywhere. Just say ‘Lord, Jesus Christ, have mercy on me’ gently, without pressure or feeling any tightness. Intensity and not duration is more important in prayer. Pray even for five minutes, but your prayer ought to be offered to the Lord lovingly and with longing. This five-minute prayer may be more valuable than prayer which lasts all night. This is, certainly a mystery, but it happens. When you had forsaken every worldly battalion, then you joined yourselves unto the Master in heaven, as the Lordʹs forty‐numbered contenders who won the prize. Inasmuch as you have gone through fire and through water, O blessed ones, you worthily received * heavenly glory from on high, and manifold crowns. heavenly glory from on high, and manifold crowns. And trampled upon the band of the idols. They deposed irreverence in favor of reverence. These steadfast ones were preachers of piety. They, without a doubt, were teachers of precision. They ever heal the sick, and deliver from evil spirits. They make the blind see and cleanse lepers. 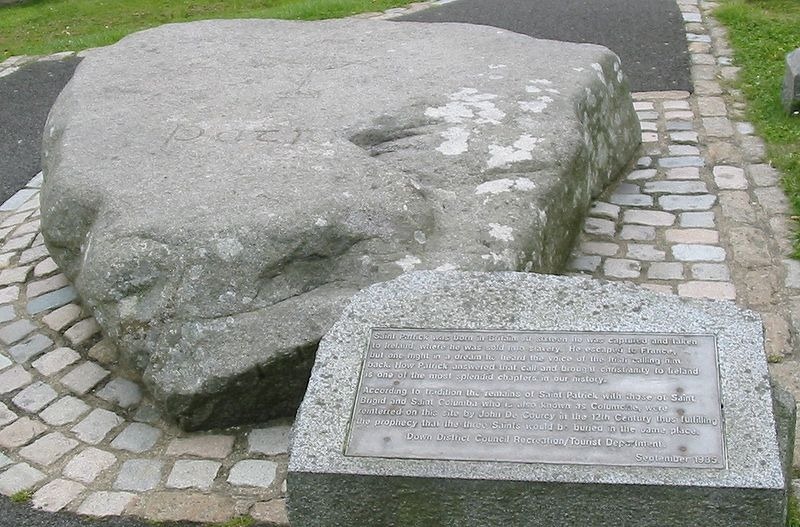 They raise up from the dung hill and lift up the fallen. They are the good fellow-traveling guides. 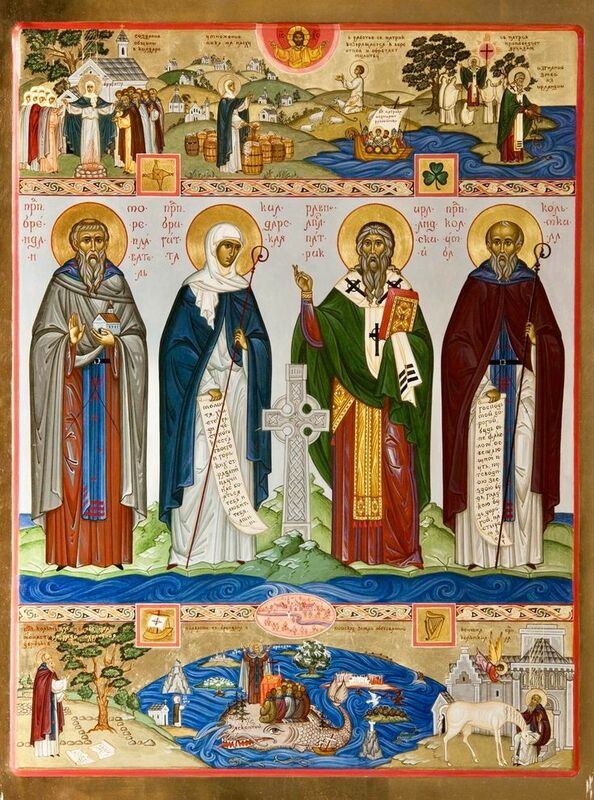 Shines this joy of the Saints. The Saints are never succeeded by night. And after it sinks at dusk, again it comes back to all. How they were able to traverse the hurricane of deeds. And they hear from Him: "You glorified me upon those on the earth. For He pours forth the waters of an ineffable spring upon them. The unconquerable phalanx of forty athletes. And fervently make war against the enemies of God? These all-joyous ones, who were from various and sundry places. To worship the God of all with their whole soul. As they received crowns as ones worthy, through their steadfastness. Though divided in forty bodies and known as one. And bravely resisted the devil. He reached Him Who is in the highest. And he upheld them with faith and hope, as we know.